Oprah Winfrey is making big moves to save her struggling television network, and she's tapping the Windy City to do it. Winfrey on Wednesday not only made Harpo Studios Presidents Erik Logan and Sheri Salata presidents of the Oprah Winfrey Network (OWN) effective immediately, but she also named herself chief executive officer. Starting this fall, Winfrey will expand her role as chairman of the network to become CEO and also chief creative officer. "I am ready to dedicate my full creative energy and focus as the full time CEO of OWN," she said in a statement. All future television production at Harpo Studios will be OWN's, she said, including Rosie O'Donnell's new talk show, "Rosie," debuting in October, as well as "Oprah Presents Master Class," "In the Bedroom With Dr. Laura Berman" and "Oprah's Next Chapter" in January 2012. All this makes good on a promise she made to the network before ending her 25-year run of the top-rated "Oprah Show" on May 25 in Chicago. "With the final taping of The Oprah Winfrey Show only a few weeks away, I will soon be able to devote my full energies to OWN,” Winfrey said in May. 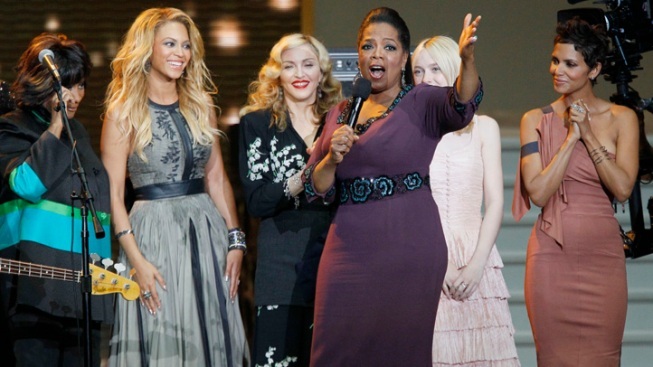 As OWN's ratings plummeted from an average 204,000 viewers in its first week to 153,000 as of May 15, experts began equating poor numbers to the lack of Oprah face time on the network. And on May 6, OWN announced that Winfrey and Discovery Communications replaced CEO Christina Norman after just five months. But Winfrey says she's not giving up. Even if it means bringing in the big guns. "By aligning the mission, talent and leadership of Erik, Sheri, the OWN team, the Harpo team, along with expertise of David Zaslav, Peter and all of Discovery behind us, we can unleash the full potential of the network," Winfrey said.